If you enjoy your active lifestyle and want to keep your independence for years to come, you should consider getting a mobile medical alert system with GPS. This will allow quick access to emergency response anywhere there’s a cellular signal. Most personal emergency response services offer medical alert devices with GPS, but they aren’t all equal. Most are small, battery operated and rechargeable, and can be easily clipped to your clothing. Some can be worn around your wrist or neck. Sometimes the device also includes fall detection, which automatically alerts emergency services if you fall and can’t press the emergency button. To determine which medical alert systems with GPS are the best, we compared the systems’ designs and aesthetics, features, prices, contracts and reviews by real customers. We only included monitored service systems because they offer the most comprehensive support with a direct line to trained dispatchers who can communicate with the device’s wearer until emergency responders arrive, no matter where you are. Starting at $49.95 per month, the Active Guardian is a portable medical alert device that works both at home and on the go. The water-resistant pendant is worn around the neck on an adjustable lanyard. It’s simple to use and lightweight. Active Guardian has an unlimited range of protection, so if you ever have an accident while in the garden or out running errands, Medical Guardian operators will send help to your exact location. Help and support: U.S.-based monitoring center with 24/7 support. Wireless provided through AT&T cellular service subscription. Contracts and fees: No activation, cancellation or equipment fees. You do not need WiFi in your home to use Active Guardian, and there are no additional fees for its AT&T coverage service. Up to $350 fee if you lose or damage equipment. With built-in WiFi and GPS technology, an emergency call button lets you talk to an operator directly through the device using the two-way speaker system. When fully charged, the battery can last up to five days. Automatic fall detection is available. For $41.95 per month, MobileHelp Duo will work inside and outside your home via cellular GPS tracking. MobileHelp’s Mobile GPS Protection System provides location services accessible through MobileHelp Connect. MobileHelp Connect is a set of online tools for you and your family that allows you to select your “responders.” With the push of a button, you can alert your selected responders, who can then see your location on a map. You and your caregivers can log in to a portal to locate your device. Help and Support: 24/7 emergency monitoring service. Multiple languages supported. Contracts and fees: No landline or cellular contract required. Free ground shipping and $0 activation. 30-day free trial period. The package comes with a base station, mobile device, cradle charger, mobile pouch and a waterproof wrist button or neck pendant. The system is compatible with MobileHelp Fall Button with automatic fall detection. Battery lasts up to 48 hours. Starting at $44.95 per month, Freedom Guardian is a wearable medical alert watch. It looks like a smartwatch and features a hi-res analog face alternating with an easy-to-push HELP touchscreen button. Perfect for active adults with a sense of fashion, the Freedom Guardian comes with oversized icons, audible features and integrated two-way communication capabilities. It’s available in multiple colors and includes a companion app for caregivers. Help and support: Reliable two-way communication capabilities to Medical Guardian’s U.S.-based 24/7 monitoring center. Unlimited number of emergency button pushes. Contracts and fees: There is a one-time equipment cost of $99. No long-term contract or cancellation fees. Advanced location tracking through GPS, WiFi Positioning Systems and triangulation. Text-to-Speech messaging will read SMS messages out loud to you. The device will alert you with reminders for medications, appointments and social events, plus low-battery notifications. 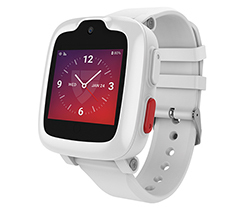 With rates starting at $24.95 per month, MobileHelp Smart is a smartwatch-style medical alert system with GPS. Its sleek design makes it perfect for someone who doesn’t want to show the world they’re wearing a medical alert system. A variety of widgets monitor your health and activity, plus keep you up-to-date on local weather and more. Military-grade durability means MobileHelp Smart is resistant to water, dust and extreme hold or cold. Help and support: Emergency support available 24/7 via MobileHelp System. Technical support and customer service available Monday–Friday, 8am–8pm, and Saturday from 9am–6pm. Contracts and fees: Watch costs $349.95. No smartphone or additional equipment required. Built-in Samsung Health app monitors your activity, heart rate, calorie and caffeine intake. Battery lasts up to two days per charge. 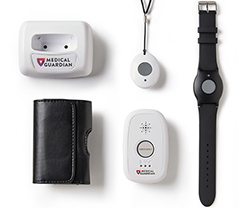 Starting at $39.95 per month, Mobile Guardian is a two-piece medical alert system. The portable device is lightweight and easy to clip on your belt or put into your pocket. Press the emergency help button to connect to the monitoring center, and the device will alert emergency responders of your precise location. The mobile device works within a range of 350 feet of the base, so you can visit with your neighbors or work in the garage without the worry of a sudden accident or fall. The pendant is also waterproof and safe to use in the bath or shower. Help and support: Nationwide cellular network. Emergency support available 24/7 via MobileHelp System. Customer service and technical support available Monday–Friday 8am–8pm and Saturday 9am–6pm. Contracts and fees: No activation or cancellation fees. No long-term contract. The package includes a standalone mobile medical alert device, leather carrying case with belt clip, choice of neck pendant or wristband help button and a charging cradle. The speaker has adjustable volume and connects to a direct line of communication with the monitoring center. Starting at $29.95 per month, Bay Alarm’s In-Car device comes with an automatic crash response, driving status updates, geofencing and a push button to summon help when you need it, plus a caregiver app with vehicle location tracking. The device works in any vehicle and is equipped with a 12V plug so it plugs into a cigarette lighter. It has a speaker, help button, cellular module, USB port, impact sensor, battery backup and internal GPS. Simply press the button for two-way communication with one of Bay Alarm’s 24/7, U.S.-based monitoring centers. It’s perfect for adults who don’t want to give up the freedom of driving their own car. Help and support: Emergency support is available 24/7 in multiple languages. Customer support is available Monday–Friday, 6am–6pm, and Saturday–Sunday from 8am–12pm and 12:30pm–4:30pm. Contracts and fees: No startup cost, cancellation fee or contract requirement. Price-Lock Guarantee means your monthly rates won’t increase. Automatic crash detection and real-time GPS monitoring. Help button works for different types of emergencies and assistance, like vehicle breakdown. Caretakers can access device’s data on any computer, tablet or mobile phone. How do medical alert systems with GPS work? A single button calls for help, or, if you opt for a device with fall detection, you don’t even need to push the button because the device will automatically detect your fall. Medical alert systems with GPS work by identifying the wearer’s location using satellite-based Global Positioning System (GPS) technology. Once you establish communication with the center, they can then dispatch emergency medical help if needed. The alert system determines the precise location of the device and connects to a call center when the emergency button is pressed. There are many safety benefits of GPS trackers for the elderly. They can provide great peace of mind both for the individual and their caregivers or family members. Provides precise location tracking at home or on the go. The portability of a mobile medical alert device with GPS is one of the most important safety benefits. No matter where a senior is, whether at home, socializing with friends or doing some other activity, the GPS locator will provide an exact location if help is needed. Some also have the option of caregiver tracking so loved ones can see the location of the wearer for personal peace of mind. 24/7 response when help is needed. Seniors don’t have to worry about not having access to emergency help, because help is available any time, day or night. This sense of security allows people to live fuller lives knowing they have access to trained responders at all times. Simple to use. Medical alert bracelets and pendants were created to be extremely simple to use; help can be on the way with the simple push of a button. There is no need to find a telephone or dial numbers, so they are ideal if someone falls or otherwise can’t get to a telephone. Easy to carry anywhere. Since these devices are lightweight and very portable, wearers can take them anywhere they go and stay safe. Some are even completely waterproof so they can be worn in the shower. Extra safety features. Many mobile medical alert devices with GPS have additional safety features that are included or can be added to the plan for a small additional fee. 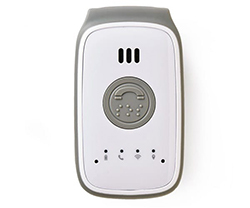 Other features include caregiver tracking, fall detection, alarms or beacons to connect to the call center if someone is unable to speak, connectivity to home-based medical alert systems, long battery life and personalized emergency action plans. Bottom line: Should I get a medical alert system with GPS? Any active senior should consider getting a medical alert system with GPS. You might think that your cell phone will be adequate if you need to call for help while out and about. A medical alert with GPS is simpler to use and clips on your person, so it’s easy to get help anywhere, even if your phone is out of reach or broken. GPS medical alerts are easier to operate than cell phones and automatically connect you to trained professionals during an emergency. When you get a medical alert system with GPS, you can go anywhere with the confidence that help will arrive quickly when you need it most. 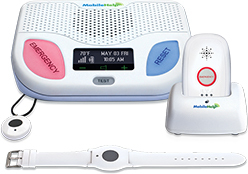 Need to buy a medical alert system?